Briliant Post that says it all really. 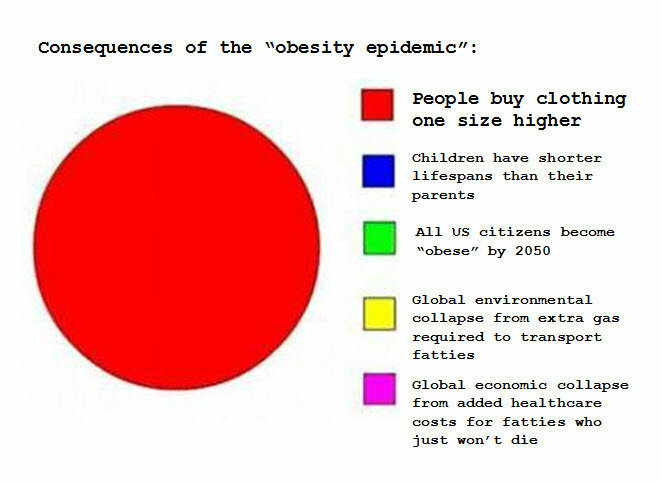 I think there is a common ground that can hopefully eventually be met regarding fat people and anti-obesity crusaders. I’m reading a lot of things on both parts that are actually in agreement but both sides for some reason don’t recognize it. I am interested for you to say more about this. I can’t speak for “Fat People,” of course, but many of us who have been advocating Health at Every Size practices are in favor of many of the actual programs advocated in the name of “obesity prevention,” like more physical activity opportunities, fewer food deserts, etc., but we consider them interventions for the common good, for people of all sizes, and can’t see how singling out fat people for “elimination” is necessary for them to be implemented. Is this what you mean by common ground? There just isn’t going to be “common ground” on the subject of “preventing” or “eliminating” us. Very thought provoking set of posts. I love the blog “Dances with Fat” b/c of Regan’s bravery and her ability to call out so many issues related to size hate. Deb you are right that our culture is steeped in ridiculous messages. In my practice I see women and men of many sizes, most have eating disorders, but even people who do not have eating disorders, sent to me by their doctors to lose weight , are afflicted by self loathing about their bodies. It is so sad. I endorse programs that are helpful to all humans in staying healthy and so far we don’t have many of those programs…I am talking about things that help people spend less time in their cars, that subsidize healthier foods, that help people understand how their own appetities are rudely manipulated by advertising, the food we do subsidize and the giant food industry. We are awash in highly palatable invented foods…it is all about money. Then the insurance companies have the gall to tell us to be a certain size or pay more for insurance and go to Weight Watchers . It is all abbout the money. I love this! This sums up the difficult feelings so well. I don’t believe that everyone who advocates healthy living and fat loss blames the people themselves who are overweight. Personally, I blame a system that has allowed for severe changes to our normal diet (additives, excessive hidden sweeteners and bad advice in general). The public trusts organizations who are advising people with confusing and conflicting information, while big Agra keeps filling us with corn, soy and their byproducts. Thank you for this. I’m dealing with a new doctor right now who assumed I must have had a heart attack when I came to her concerned about several weeks of extreme fatigue–even though she asked about my specific symptoms and none of them were heart-related, I have no history of heart disease, and I have no risk factors for heart disease aside from my weight. Thankfully, when I pointed this out to her, she agreed (grudgingly) that it didn’t really sound like I’d had a heart attack. If I hadn’t stood up to her and questioned her, I would have been given an unnecessary stress test. Which raises the question: how much of the waste in our medical system comes from fat people being given unnecessary tests that could have been avoided if their doctors had just listened? I like your graph! In reality, some people don’t buy clothing one size higher until they need clothing that’s two sizes higher. The number on the label means a great deal to them. What is more likely to happen is that all people will become obese by 2050 because obesity will be defined as having a BMI greater than 12. Many fat people are the biggest fat haters around. Sad but true. They look at their fat with all the fondness with which they might gaze at a malignant tumor. Ashley, I think that many times what appears to be common ground is a facade. In other words, doing healthy things doesn’t count unless one gets thin from them. Otherwise, why would Ragen at DancesWithFat who is an award-winning dancer get so much hate mail? Why would Kelly Gneiting’s achievement (he weighs 400 pounds and has completed a marathon) get pooh-poohed by so many? – Fat is a normal presence in a healthy body. Excess presence of fat is not. – Fat is introduced to the body by the combination of uninformed and/or unhealthy eating habits and no, low, or inconsistent activity. – Fat can be reduced healthily, but it is something that requires time, conscious rehabituation, and sincere discipline to affect. I realize that last one pokes what has become a sore spot for many battling with fat because there is a cultural penchant for assuming that anyone who has excess fat “obviously” either has not devoted the time, does not engage in conscious rehabituation, or lacks sincerity and/or discipline. It remains that the point is intended to speak to the reality of what is required, not to engage the sad state of our culture in regards to it. At the end of the day, the opinions of others (any others) affect precisely as deeper or as long or as well as we allow them. Those who are outside our heads, outside our experience, they have no knowledge from which to speak, period. I take the point of your post and will not deny that it is quite valid from the perspective of one who is externally referenced and for whom the opinions and thoughts of others carry much weight (cough)… it remains that perhaps the better and more beneficial discussion would begin with examining why the utterances of those who have no vested interest in your health except as a springboard to launch their own status or superiority should receive ANY of your energy or focus. As someone who has been on both sides of this particular coin (maximum weight = 375lbs), I can tell you that it was a struggle for me to truly empower myself by disempowering the world at large from having this effect upon me. But, to this day, I count it as the most beneficial, helpful, and liberating thing I have accomplished. As trite as it may sound, you DO have the capacity to control and determine who received the gift of being able to matter to you. Choose wisely, particularly in this arena, because, as we know, it affects your very life. I don’t fundamentally agree with any of this. 1) Fat is a normal presence in a healthy body. Excess presence of fat is not. This is tautological, and as such , not useful. Excess or insufficiency of just about anything is not normal. But Dr. Burgard is asking where the dividing line is. I’m sure we can all define an extreme amount, although we probably wouldn’t put it at the same spot. 2) Fat is introduced to the body by the combination of uninformed and/or unhealthy eating habits and no, low, or inconsistent activity. Way to insult most fat people. It also assumes we’re getting stupider as we get older, since it’s well known that the middle-aged tend to be fatter than the young. You may as well say that fat is introduced into the body by people who are smart enough not to starve themselves. It makes just as little sense. 3) Fat can be reduced healthily, but it is something that requires time, conscious rehabituation, and sincere discipline to affect. You’re not saying by how much, though. Or even whether it’s necessarily a good idea. But it certainly is a way to show off how virtuous one is, isn’t it? I’m not battling with fat. I’m fat myself. I’d rather save the energy to battle with people who try to battle with my fat. At the end of the day, the opinions of others (any others) affect precisely as deeper or as long or as well as we allow them. This I especially don’t agree with – it’s an extremely rare ability for this to be so. Since we’re not generally hermits, the opinions of others do affect us whether we want them to or not. It starts when we are young, and the opinions of our parents not only affect us; we swallow them up as we are genetically wired to do. We deal with individuals and society later on, and in order to learn how, we have to be affected by opinions. We are best affected when we don’t even realize it’s happening – do you know anyone who admits to caring about television commercials?